Premiering: Tuesday, Feb. 26th at 9 p.m. (central) on CBS and also airing on Tuesday, March 5th before moving to regular Friday, 8 p.m. slot o March 8th. Adding another crime series to the CBS lineup is roughly the same as using the word "journey" on a reality-competition show. The great equalizer, though, is if the newcomer is any good. And Golden Boy is quite good, judging from its first two episodes. Britisher Theo James, a veteran of one Downton Abbey episode in Season 1, has the potential to be CBS' biggest heartthrob in many a season. But his character, future kid police commissioner Walter William Clark, would be lost without the strong support of Chi McBride as burly mentor Don Owen. Tuesday's premiere begins with gunshots and screams from New York City denizens in the vicinity of them. Young beat cop Clark, with just three years experience, emerges as a hero after shooting and killing a hostage-taker before saving the life of his partner with some hasty CPR. It sounds pretty standard issue. 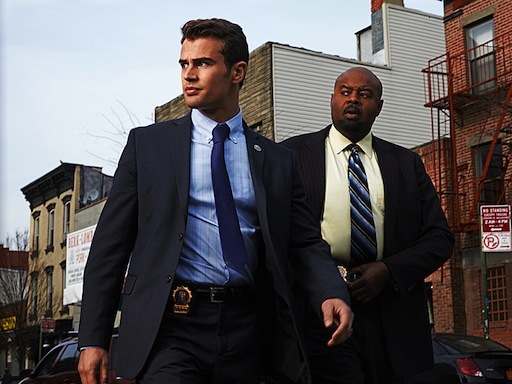 But Golden Boy also makes periodic trips to "Seven Years Later," with the very slightly graying 34-year-old Clark newly serving as NYC's youngest top cop ever. "Getting here was a long road," Clark tells a guest-starring Richard Kind, who asks in turn, "So you tell me, commissioner, you a master politician or just a savvy cop?" Golden Boy spends most of its time charting Clark's wonder years. Offered any squad room he wants after his heroics, Clark demands a spot on the homicide task force. Its best known member, territorial detective Christian Arroyo (Kevin Alejandro), takes an instant dislike to the kid and begins plotting his downfall. The gruff Owen, just two years from retirement, gives Clark guff but means well with his periodic lectures on following procedure. The task force's other principal members are Arroyo's hard-knocks partner, Deborah McKenzie (Bonnie Somerville), and big lug Joe Diaco (Holt McCallany), who prides himself on getting prime tickets to big events like The Book of Mormon and Knicks games. Clark also has a troubled kid sister named Agnes (Stella Maeve), whom he sets up with a job at a nearby diner frequented by cops. CBS has seen to it that Golden Boy is typically affixed with a crime-of-the-week that gets solved by episode's end. But its strong suits are the character mix and the building blocks leading to Clark's rapid rise. The first two episodes both end with him as commish. And in the March 5th hour, he's walking with a noticeable limp. How he got it is yet to be seen. James is both impressive and knock-out good looking as the title character. But the well-worn McBride, this time affixed with a New Yawk accent, is the deep-set anchor of Golden Boy. His very first line is a deadpan winner. "I'm your partner," he tells an initially disappointed Clark. "Don't knock yourself out doin' backflips." McBride, a survivor of UPN's super-panned 1998 series, The Secret Diaries of Desmond Pfeiffer, has had a tough run of late in short-lived series such as Killer Instinct, The Nine, Pushing Daisies and Human Target. But CBS infrequently fails on the cop series front, so maybe this is finally the one for him. After a pair of Tuesday outings, Golden Boy will move to its regular Friday, 8 p.m. (central) slot on March 8th. It's replacing CSI: NY, which has its season finale on Feb. 22nd. It'll be a surprise if Golden Boy doesn't stick. The cast is engaging, the premise is intriguing and the genre long has been CBS' ratings-rich specialty. Dead bodies are this network's lifeblood. And it always has room for one more.